The two countries are also not new to terrorist attacks. Terrorist incidents in Algeria include the 2013 attack on an oil facility that caused the death of 11 Algerians and 37 foreigners. In Morocco, three tourists were attacked with knives in 2015 and Marrakech, a popular tourist destination, was attacked in 2011. As many as 1 500 Moroccans and 200 Algerians have joined Islamic State (IS) and regional officials have voiced concern that fighters are returning home from the collapsing IS caliphate in Syria, raising the terrorism risk. Algeria and Morocco have maintained strong counter-terrorism approaches that depend heavily on military operations. The two countries also closely monitor their mosques and guide training of imams. But it is also time for both countries to develop strategies for preventing violent extremism among their sub-Saharan African migrant populations, a new Institute for Security Studies (ISS) report suggests. Most migrants in Algeria and Morocco come from the Sahel region and West Africa, where active terror groups include al-Qaeda in the Islamic Maghreb (AQIM), Boko Haram and IS. AQIM particularly is expanding its membership to people from Mali, Mauritania, Senegal and Niger. 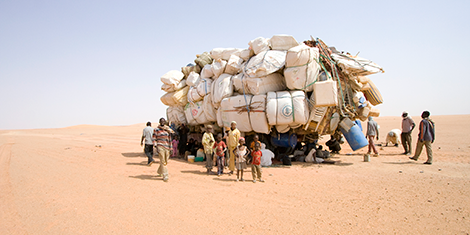 The number of irregular migrants in Algeria and Morocco is not known, but it is estimated that up to 100 000 people from Mali, Niger and Burkina Faso now live in Algeria, with 50 000 sub-Saharan African migrants recorded in Morocco in 2014. Many of the migrants are living in economically and socially precarious conditions. They face considerable discrimination, which can be fertile ground for radicalisation. Hosting tens of thousands of migrants for a longer period is a new experience for Algeria and Morocco. Yet current trends suggest that the number of migrants heading to these countries will increase due to harsh economic realities and growing unemployment in their countries of origin. There are benefits to legalising migrants, and both countries recently announced plans to legalise their migrant populations. In July 2017, Algeria said it would grant residency rights and work permits to sub-Saharan African migrants, aiming to address a shortage of manpower in the agriculture and construction sectors. This mirrors Morocco’s 2013 decision to give 25 000 migrants a one-year residence permit. The legalisation of migrants is commendable, particularly at a time when wealthy countries in Europe as well as the United States and Australia are shutting their doors to migrants. Legalising migrants brings political and economic benefits to countries. In this case, it could enhance Algeria and Morocco’s negotiation power with the European Union (EU) and improve relations with sub-Saharan African countries. Giving migrants opportunities should also boost economic growth. Strategies to prevent violent extremism should align with the 2015 United Nations Plan of Action for Preventing Violent Extremism, which includes addressing conditions conducive to terrorism, and ensuring respect for human rights and the rule of law. They should include provision of education, health and job opportunities, with empowerment of marginalised communities and strategic communication aimed at migrant populations. This would address many of the key challenges that migrants currently face. Putting into operation their regularisation schemes would be a good first step for both countries, and Algeria should start issuing residence and work permits to migrants as per its announcement. Morocco should operationalise its second round of regularisation. This would give the basis for developing migrant-tailored strategies to prevent violent extremism. Both countries should strengthen their bilateral cooperation to effectively implement their respective laws and share experiences for future improvements. They should also strengthen cooperation with neighbouring countries – especially Mali, Chad, Niger and to some extent Mauritania – and others of migrant origin. The aim would be to encourage legal migration and improve border security. In recent months, however, Algeria has increased arrests and summary deportations of sub-Saharan African migrants. This, unfortunately, sends mixed messages regarding the country’s stand on sub-Saharan African migrants. Expulsion can drive migrants towards radicalisation – and terrorist groups can use this as an opportunity to recruit. Morocco and Algeria should both develop migration policies that promote social and economic inclusion before radicalisation manifests. The countries’ governments need to work hard to raise public awareness of the good things that come with migrants, and the need to accept them. Tsion Tadesse Abebe is a Senior Researcher in the Migration Programme, ISS Addis Ababa.